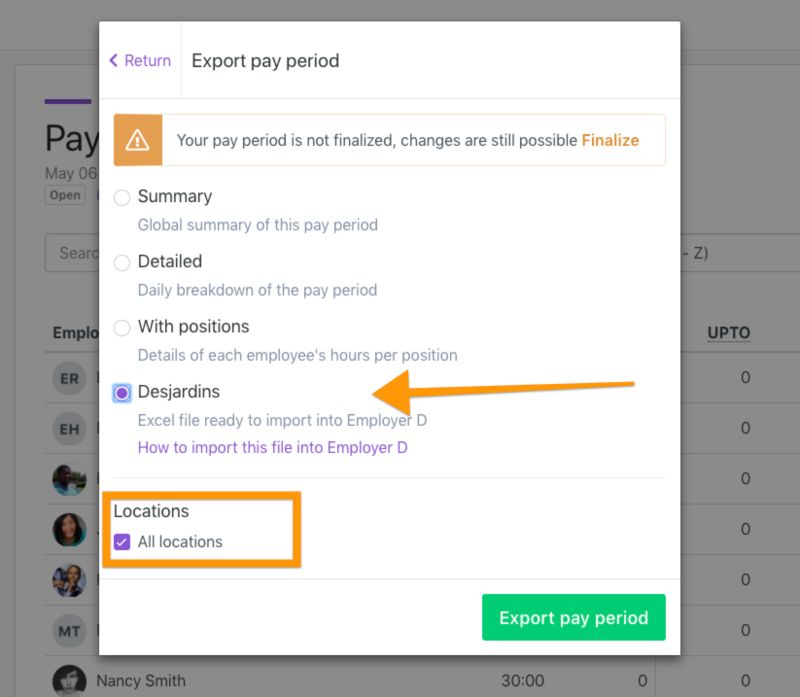 Before exporting your first payroll in Employer D format, you must set up your configuration. Here is an article that explains How to set up Employer D exportation? Click on the « Payroll » tab. Click on « Tools ». Click on « Import transactions ». Click on the « Choose file » button to look for the file that was exported during step B). Select « Excel with columns » file format. If you have more than one company in your payroll system, select the right company number in the choices shown to the right of the « Company » title. Click on the orange / red « Import » button. If the word « Completed » appears in red, to the right of the « Status » title, the importation was successful, and you can now make manual changes to your payroll system, as needed. Data imported in Employer D is always per week; this allows you to understand the earning codes repartition more easily. If a red « Not completed » status text appears, the importation process has failed. Check out which of the lines are causing the errors in order to correct your import file. Details for each error are shown at the bottom of the page. I) How to correct errors? Each error is well detailed in the error table. Serial number : Serial number of the employee to verify the Excel payroll export file. Line no : Reference line in the Excel file. Helpful for quickly spotting the error. Message : Used to see the type of error you’re dealing with. For example, if you see « G43 », it means that a data is incorrect in the Earning 43 column for overtime gains. Blue « Correct » button : Allows you to manually correct errors directly from your payroll system.